Sprouts-in stores they cost a pretty penny and they never seem to last that long before going slimy. I love the freshness of sprouts, and was always willing to pay for them. That is, until the day I tried sprouting. Once I learned how ridiculously easy and inexpensive it was to sprout seeds, I was hooked! Pictured below are my lentil sprouts. Growing your own sprouts allows you to control the amount, the type, and timing of what you want to eat. It's also a way to garden indoors year round. So even when the cold winds blow, you can have fresh, crunchy sprouts that you've grown. I love that! Why sprout? Sprouts are packed with fiber and protein. By sprouting seeds you also make the seed/legume/nut more easy to digest. Think of a seed as containing all of the vital nutrients in it to help a plant to begin growing. The seed must contain all the nutrients needed until the plant can begin to grow leaves and produce its own food via photosynthesis. Until that point, it relies on stored energy from the seed. When you sprout a seed, you are swelling the protective seed coat until it opens and the young plant emerges. At this point, it has tons of energy in it. The amount of protein needed for growth (same as for you) is being released to help the plant. Consuming the sprouted seeds within a short period of time allows for you to consume these high levels of nutrients and enzymes in their raw form. Before the plant can produce leaves, it's high in nutritional density in the form of fiber and protein, while being very low in caloric density.You can sprout just about any kind of seed, bean, or nut. Soaking, rinsing, and draining are the only techniques needed. If you are interested in sprouting, start with one kind of bean or seed to start. I make sure that I'm almost always soaking some form of seed or bean, so that once I've finished eating 1 jar, I have another ready to be finished. 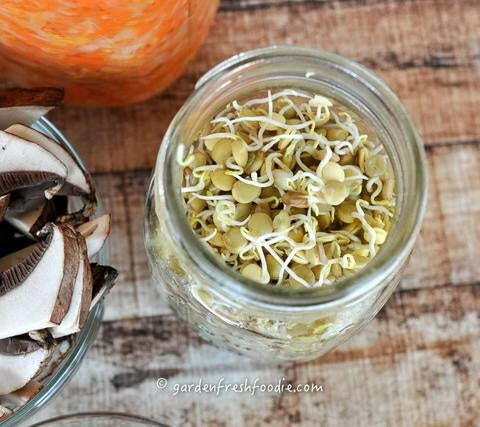 Top your favorite Veestro dishes with fresh sprouts to bring in some live foods. If you're interested in the technique of growing sprouts, check out my latest post on www.gardenfreshfoodie.com to learn the process.